Every day dozens of potential storage renters are seeking storage in Vista, CA. 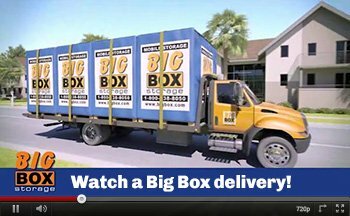 While there are numerous self-storage companies in North County San Diego to select from, only Big Box Storage offers the convenience of storage delivery and pickup coupled with a low-price guarantee. If you need storage in Vista, forget renting, loading, and unloading a truck. 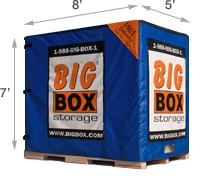 Instead opt for the convenience of having a “Big Box” storage unit delivered right to your Vista home or business address in zip code 92081, 92083 or 92084. Once delivered, take your time loading it. Whenever you finish (same day, next day, next week, etc. ), the company will send a driver to pick up the full Big Box(es) for transport back to the company’s secure storage facility in the Vista area. The Big Box Storage facility that services Vista offers numerous lines of security including perimeter alarms, on-site staffing, video surveillance, exterior gates, and motion sensors. Should you ever need to get into your storage while in the facility, you’ll be able to do so any day of the week. Big Box Storage is open daily from 7:30am to 6:30pm. Once you reach the point in time when you no longer need to continue renting the storage unit, you can schedule to have it re-delivered simply be calling Big Box Storage at 760-453-0710. Please feel free to view the company’s standard delivery area by visiting the service area page. Should you find that you’re moving beyond San Diego County – possibly to another state – you’ll always have the option to have your rented Big Box shipped right to your new address anywhere in the United States. Scheduling a Big Box delivery in Vista today is quickly and easily by using the online scheduling form. By scheduling online, you’ll also receive an instant $25 discount which can be applied right to your first month’s rent. Alternatively, please feel free to contact a company representative by calling 760-453-0710.